As you may be aware, on the 8th June 2015 the DVLA stopped the production of the UK counterpart licence on which convictions are recorded, in favour of a more consumer friendly computer database called Share My Licence. Insurers used to use the information on the counterpart driving licence and photo card to help validate the information you provide as well as helping to prevent fraud and speed up the process of a claim, should you have one. Share My Licence stores all of this information but in order to view this information, we require you to provide us with a ‘check code’ provided by Share My Licence along with the last 8 digits of your Driving Licence Number. When arranging your insurance, you may be required to provide your driving licence information for us to check on your insurers behalf. Some or all of the information you provide by using ‘Share My Licence’ may be passed to insurers and other necessary companies. You will need to log in using the requested details and then click on the fourth tab entitled “Share your licence information”. 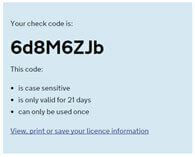 Please note that codes are case sensitive, valid for 21 days and can only be used once. You will need to create a new code for each company that requests access to your licence details. Please include the last 8 digits of your Driving Licence Number when emailing us your code and have your Driving Licence Number to hand when calling.